It was Thursday, June 3rd, 1773, when Mary Simpkins married Robert Rand in Boston. Mary’s father, William (1704-1780), was a well-known jeweler and silversmith. Rand was a Boston merchant, from an established family. Despite the fact that the Boston Tea Party was a mere six months away and her husband took part in militia activity in Bedford, Mary (b. 1754 ?) wore wedding shoes from London. 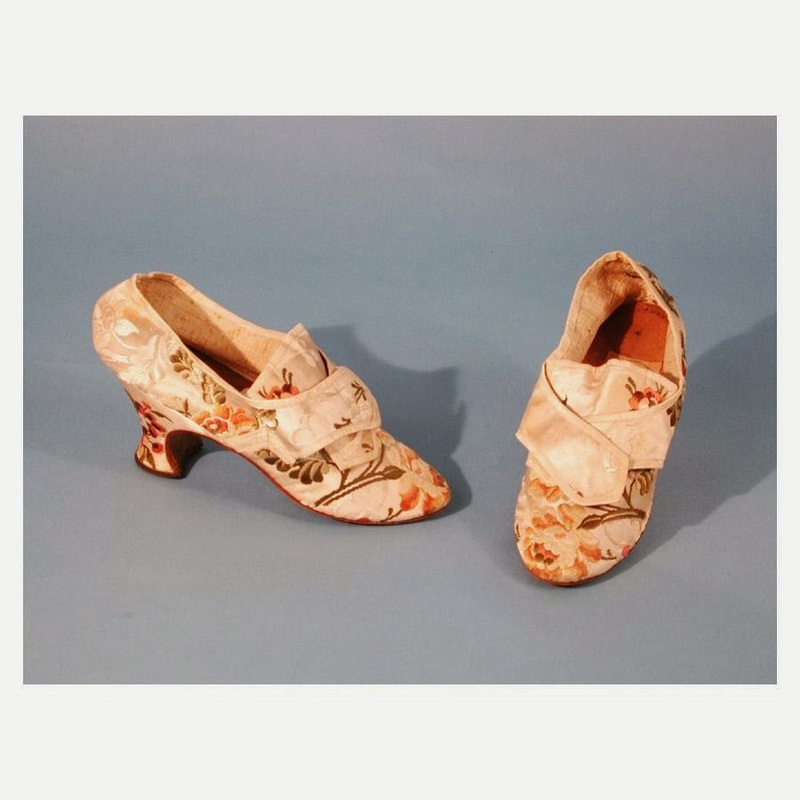 She was most likely quite pleased with her stylish cream-colored silk shoes, brocaded with pink and green flowers. 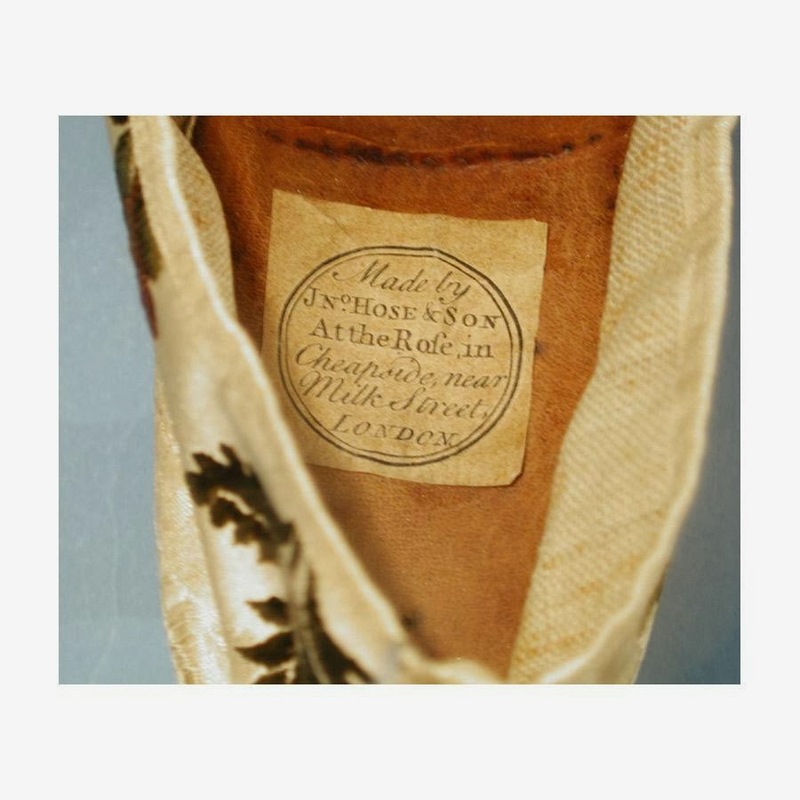 The label reveals that they were made by the cordwainers “Jno. Hose & Son. At the Rose in Cheapside near Milk Street. London.” Clearly a treasured family heirloom, they were passed down to her daughter and eventually, found their way to the collections of the Connecticut Historical Society. About a year after their marriage, Mary and Robert welcomed their first born--a daughter. The child did not survive and was buried at the Granary Burying Ground, according to family sources. A poignant memento survives from this troubled period in Mary's life. The soon-to-be or new mother made a pincushion for her firstborn; it bore the inscription: "Welcome, little stranger, to Boston, though the port is block't up 1774." It was a token to her new role as mother, but also to the tumult of revolutionary politics. Enraged over the Boston Tea Party, Parliament had passed the Boston Port Act in March, and the Royal Navy had formed a blockade around the port of Boston. Patriot families fled the city, as Boston’s population fell from some 15,000 to fewer than 3,000. Mary was one of those who fled the besieged city. While Robert fought against the British, serving as sergeant of the Bedford minutemen at Concord in April 1775, Mary went to Chelmsford, Massachusetts. She did not return to Boston until sometime in 1777, after Washington’s artillery forced the British forces to move on to New York. In her flight to Chelmsford, Mary had to cross British checkpoints, where suspicious British soldiers examined the few personal items that frightened Bostonians could pack. For the grieving mother, few items were more precious than the modest keepsake that held the memory of her lost child. The image posted here is from family collections. Today, even after a period of over two centuries, we can relate to Mary’s feelings of both joy and sadness, represented by these treasured family artifacts.